Famous British singer, Phil Collins (60 years) has announced his retirement from the music scene, basing his decision on the fact that he feels overtaken by events. British singer ends his career after four-decades. Also, Phil Collins feels disappointed about what is happening today in music and is convinced that nobody will miss him. Despite the success throughout his career, the legendary rocker recognizes that music is another market demand and that he can not adapt to this world. Another reason for the withdrawal of the artist would be the poor state of his health: problems with hearing, a dislocated vertebrae, and damaged nerves in hand. Phil Collins became known with the launch of Genesis in `70, playing at drums. Later, after the retirement of Peter Gabriel,he became the lead singer, launching, in parallel, memorable hits such as “In The Air Tonight”, “ Against All Odds or Two Hearts”. Collins, who now lives alone in Switzerland after the divorce back in 2007(third wife), has enjoyed enormous popularity in the over 40 years career as one of the highest-paid solo artists of all time. “Too much success, ” said with regrets british singer. He is currently focusing on his two sons, Nicholas and Matthew, whom he had with the third wife, Orianna Cevey. Collins said he’s not afraid that he can not play the drums, but that he can not cut a slice of bread or build things for his boys. Recently, Phil Collins refused to appear on David Letterman’s show,an extremely popular show, on the pretext that at the time of the show his sons were at his place. Collins recently said he considered suicide because he was constantly criticized for his work, but dropped the idea due to his children. Will We Miss Phill Collins !? Phill Collins left the Genesis in 1996 after tey had a colaboration of 26 years, then in same year release the album “Dance Into the Light”, “Best Of” in 1998 and “A Hot Night In Paris” in 1999. Winner of an Oscar in 1999 for the soundtrack of the film “Tarzan”, which included the song “You’ll Be In My Heart”, Phil Collins has won seven Grammy Awards during his career and has sold over 150 million records. In the last decade he has not released an album. Sad, very sad day, He definitely will be miss and is true now days “music” is a completely animal all together, listen to the “oldies”, “classics” from the 70s and 80’s. I will miss him. His 70s and 80s music with Genesis was some of the best. He had such a passion for music. Throwing it All Away will forever be my favorite song by him. Sorry to see you go, Phil. Very sad day. Collins will never be forgotten for his work with Genesis, one of the best bans that ever existed. Too intellectual for most people. You will be missed very much but we will not forget your music. Thank you for allowing us to enjoy your talent all of these years. We wish you the best for you future. I have loved your music all of my life and I am 43 today is my birthday Phill you are so special that God has blessed you beyond what you know about .You have given me so much joy with your music that has carried me a life time.Just because we get older and things change does not mean that we toss aside the people that carried us when we needed them the most. I will never forget you ever !!! Thank you for the music and your dream and inspiration I hope you stay in music production part time to teach a new generation “Art” to hold off fame because there is a big difference you received fame because of art not in spite of it. I hope you have time to read the great comments from your fans. Genesis is one of the best bands in the world, and you were part of the magic we all enjoyed. Your passion for having fun on stage came out at every show. I have seen Genesis more times than any other band, and have enjoyed every show. I wish you the best with your health and family, and hope you live in peace for the rest of your life. I appreciate all of the hard work you have put into the music you have both written and played. You are a multi talented musician with very few peers….Genesis will be missed, you will be missed…thank you for the joy you have brought to our lives….it is a sad day for Genesis / Phil Collins fans…..
I’ll miss him. He is one of the greatest musicians of all times. And yes thanks! for all those lovely tracks that have thrilled us over the years. 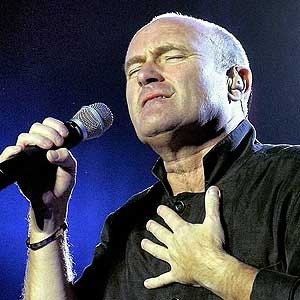 Phil Collins is the soundtrack to my life !! We cant stop loving you ( Why should I?) and yes Pun intended !! I have always ejoyed his music. I have never been able to go to a concert. But I will never forget! Phil, enjoy your life, time with the boys and build your future. Thank you for being a part of my life. I saw a documentary last year on HBO about motown music that you made. It was very good. I liked the songs that you sang they are some of my favorites. I am sorry about your health. I am glad that you have two sons. My wonderful son is such a great blessing to me. I still like to hear your great voice. I wish I could see that documentary again. I really liked it. I wish you the best in life. I an thaqnkful that gave you such a beautiful voice and that I got to hear it.